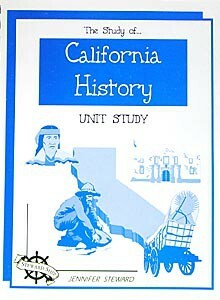 The Study of California History, Christian Unit Study Guide by Jennifer Steward. This 4-6 week unit study is recommended for K-8th grades (content can be used for higher grades - just use upper level books and materials). Suggested resources include Ishi-the last of his tribe, Island of the Blue Dolphins, The Sign of the Beaver and Patty Reed's Doll. From Stewardship Publishing.